Now the only thing left to do is deliver the finished piece. Yep, I am done with the Lilac Leaf Shawl, and I am really pleased with it. I could have finished it sooner, but I agonized a bit about just how many repeats of the center chart I should do, and then I procrastinated a little about the garter-stitch-kitchenering. Since this is not for me, I was a little unsure about what finished dimensions to shoot for, and I could not remember just how much Jaggerspun Superfine Merino blooms/grows in the blocking process. After some smoothing, measuring, draping, and guessing, I settled on one last repeat, and it was the right decision. The finished measurements of 75" x 20" seem like a nice size. As I said, this is not my shawl, but something I am donating. Recently, the newsletter for the lys put out a call for shawls, and I decided to participate. The request comes from a local chapter of a veterans' organization collecting gowns for the Marine Corps Ball, and they are hoping to pair wraps with the gowns. I have not decided whether or not I am going to make any more for this, but I have thought about perhaps weaving something. I just hope what I have done is appropriate for the occasion and fits with what they are seeking. It has been a time of quickly knitting a collection of tiny things, and I think this selection is particularly spectacular, although the rushed photo is not. The zombie and the clown are contenders for topping the favorites and/or creepy list. 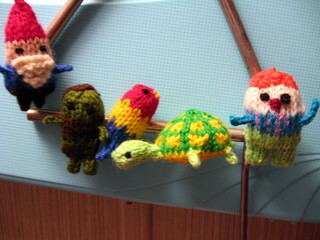 The release of the Tiny Pets collection meant that I had to include some of those, and the gnome is the obvious choice for rounding out the set. These are a gift for the daughter and son-in-law as they move out into their first place. Yeah, this is another opportunity for me to put lessons learned into practice, leaving worry and anxiety aside, and focus on hope, growth, and positive potential. After all, both methods yield results, but only one is helpful. Sometimes, lace is the right answer, especially when I don't know the question. This is certainly one of those times. I have been needing a bit of a break from the POP! Blanket squares, and this is definitely a departure from that project. I had tried this pattern (Lilac Leaf Shawl) before with handspun, but I was woefully under-yardage for it. That mistake was my own; (actually, it was a series of mistakes) combine that with the fact that many knitters have needed more than the listed amount, and I did not get very far with it last time. 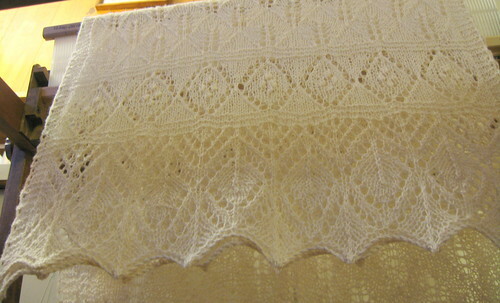 This time I have more than enough, and the lace is flowing off the needles effortlessly and swiftly. There was a moment when I applied the tape measure to check my progress and the lace refused to grow no matter how much I knit. 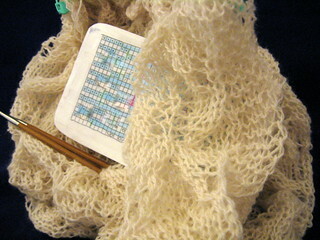 Then, as I approached the end of the first cake of yarn, it finally released about ten inches of growth. I am nearly done with the project, (only about 7700 more stitches to go) as I already knit the other end and it waits patiently in the yarn closet until it is time for grafting. Once I finish this, I want to get something new on the loom. I need to have some success after something that did not work as planned. I might show you later, but it needs to sit and think about what happened before it is ready for photos. Before we get to that, I will show you what happened with my Tour de Fleece, but that will wait for another day, too.